 Khumbu region of Nepal trekking is the encapsulation of the enterprise and divinity of all the adrenaline surge exercises that could ever happen in Nepal under walking holiday category. 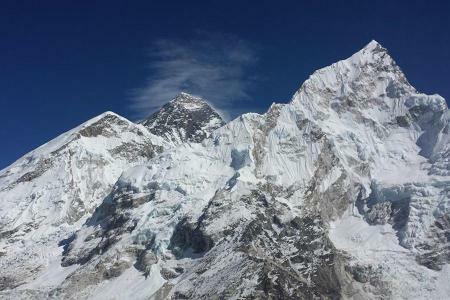 Everest region’s three high altitude passes along with the Everest Base Camp and Kalapathar will test great deal of traveler’s physical endurance testament. Kong Ma La Pass, Renjo La Pass and Chola Pass – these passes together forms an excellent trekking package having fun, excitement, adventure, challenge and intrepidity. 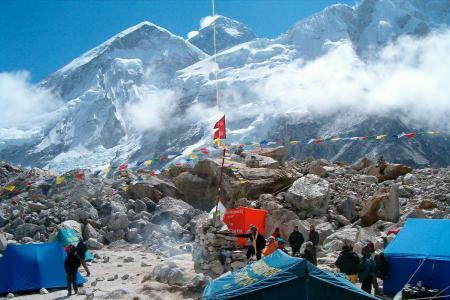 The feature of Everest Three Passes Trek is the opportunity to witness the Everest Base Camp and Kalapathar too. Unique Adventure International offers this stunning adventure to the Himalaya served to you in help of master trekking guides with perfect accommodation. Everest Three Passes Trek begins from the mountain flight to Lukla from Kathmandu. The perspectives of towns, sloping territories, timberlands and the nearby mountain perspectives would give you the things to come in additionally trekking in Everest locale. The simple trek from Lukla to Phakding would be the warm up strolling in the trail. When you have achieved Namche Bazaar then the bona fide Sherpa culture begins to get in to you. Namche Bazaar is thriving marketplace of entire Khumbu region. The acclimatization climbing to the world's most astounding found in The Everest View Hotel gives shocking all encompassing perspectives of the mountains and encompassing slopes of the area. When you have acclimatized the next day the trek to Tengboche the perfect place of the Khumbu arrives with just about 4 hours of walking. The serenades of supplications and possess a scent reminiscent of the incense would give the otherworldly coaxing to you. The following day's trek would be towards Dingboche (the valley overlooking beautiful Mt. Amadablam) then the primary pass can be crossed the Kongma La Pass. The pass is of rough territory and the watchful strolling in the trail ought to be improved prompted by our trekking pioneers. From Kongma La Pass the outing to Gorakshep would be stunning feeling as the trekkers would expect the Everest Base Camp in the region. The short climb towards EBC takes you to the great place in the foothill of the tallest snow covered heap of the world Mt. Everest. The following day's outing to Kalapathhar for the grand dawn see in the mountains stirs the soul of enterprise in your brain. When you have appreciated the dawn see the trek takes after towards Chola Pass. This is the overwhelming intersection of the trekking. The trail is frequently secured by snow and the master guides are exceedingly required so as to stroll without meandering. The lofty perspectives of mountains and the dread of obscure would give you the colorful mountain franticness feeling. 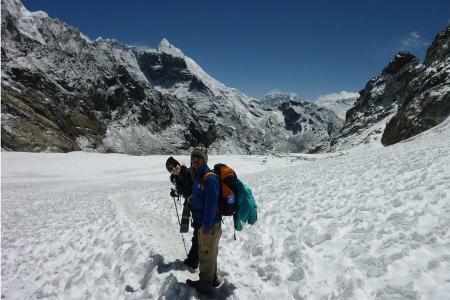 The last Pass in the Everest Three Passes Trek in Nepal is the Renjo La Pass. The pass is to some degree desolate and way is relatively less demanding than past two passes. At that point the trek course back to Lukla for the flight to come to Kathmandu. The trek goes by the Namche Bazaar which would be again the distinctive feeling for you with the feeling of triumph in your psyche. Unique Adventure International is exceedingly satisfied to display this wild experience bundle of the trekking in Everest Region of Nepal. Come and Book this excursion with us for flawless accommodation and best cost. 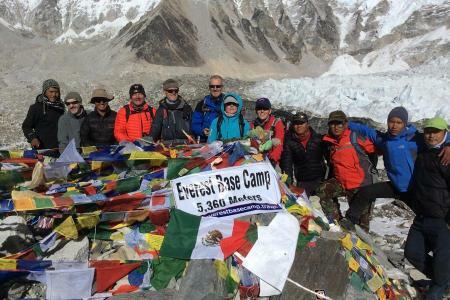 Everest Three Passes Trek could bring spark of intrepidity and adventurous enlightenment for travelers. Early in the morning, transfer to airport for a 30-minute connecting flight to Lukla (2,827m). In Lukla, we start our trek by going down to the Dudh Kosi River and then take the major route to Namche Bazaar, located just over Chaunrikharka. The path is smooth and we pass by the tiny village of Ghat (2,550m) before reaching Phakding (2,610m), a pretty village consisting of some 30 houses. The day will begin with a gentle walk to Monjo, another beautiful Sherpa settlement along the trek; official entry into the Sagarmatha National Park where you will have to show your permits (SNP entry permit and TIMS card) at the office in Monjo. The trek to Namche Bazaar involves a tough uphill climb of about 590m, taking approximately 5-hours; however, halfway up the hill you will be able to see Everest and Lhotse for the first time. As you approach the town of Namche Bazaar, the peaks of Thamserku (6, 648m) and Kwangde (6,224m) are visible to the East and to the West, close to the sacred mountain Khumbila (5,707m). As a gateway to the Khumbu region, Namche Bazaar, at an altitude of 3440 meters, is famous for its many bakeries and local market (haat bazzar) which takes place each Saturday. Built on a steep mountain bowl with excellent views of high Himalaya on either side, the town has restaurants, shops, banks and currency exchange offices. Remarkably, for such a remote location, you can also find cyber cafes and pool halls. It is important to walk to higher altitudes while you stay two days in Namche Bazaar. There are options here to trek to Khumjung, where you can visit the local school and hospital, the great Everest Sherpa Tenzing Norgay, or the airstrip at Shyanboche (3,720m). Above the airstrip is the Everest View Hotel, which was set up by the Japanese to bring affluent tourists into the region for a prime view of Everest. The scheme was brought down by the fact the hotel was at nearly 4,000m and many suffered from altitude sickness. The day begins with a slight climb up about 10-minutes and descend back to the Dudh Koshi at 3,550m before ascending to Tengboche (or Thyangboche) at 3,870m. The views of Everest, Thamserku, Amadablam and the valley are simply breathtaking. At an altitude of 3,870m, Tengboche is a charming spot built around the main Tibetan monastery in the region where you can enter and listen to the monks chanting their mantras. 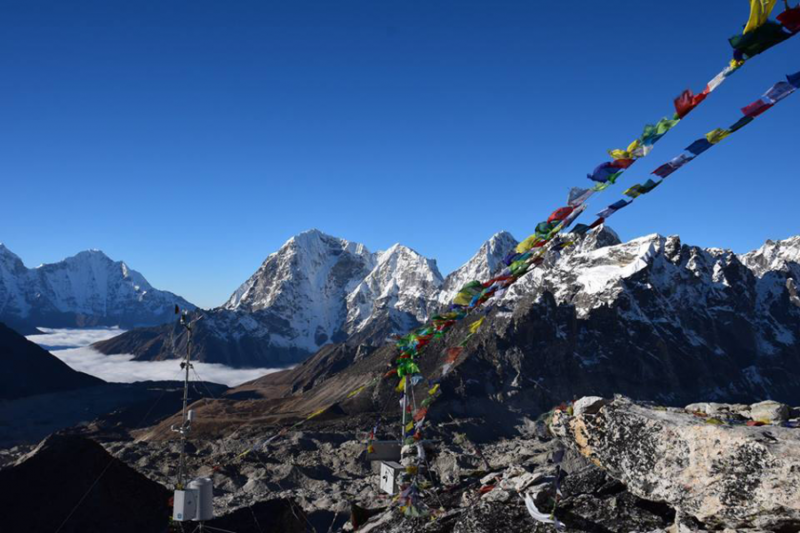 The views of Lhotse, Everest and Amadablam are unforgettable. Your journey will pass through wooded forests and cross the Imja Khola valley. The views will become more impressive as the high Himalaya begins to surround you. You will make a stop at Pangboche, an interesting gompa site above the main village. This is the oldest monastery in the region and apparently dates from the introduction of Buddhism to Khumbu. You will then climb up to Dingboche at 4,360m, where you get spectacular views of Amadablam and Island Peak. Today, we will have a short walk to Chhukung. 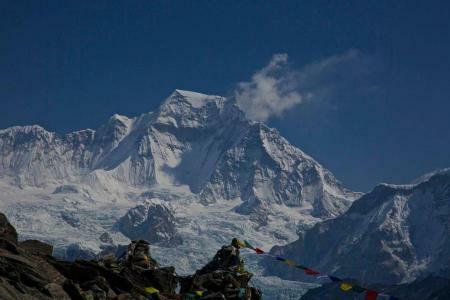 You will head to another beautiful part of the Khumbu region, Chhukung, which offers you magnificent views of the Mt. Makalu, Island Peak, Peak 38 etc. Today we will cross one of the first three passes, Kongma La Pass. We hike high above the Pheriche and Dingboche villages, near the ridge of Pokhalde Peak, before crossing the Kongma La. It is a pretty long tiring day but you will be rewarded with the amazing views of the entire Khumbu Valley. This is another long day as we trek towards Everest along the Khumbu Glacier. We will reach the small village of Gorakhshep, where we will have our lunch. After lunch, the trail will lead us to the Mt. Everest Base Camp at an altitude of 5,400m. From the base camp, you get splendid views of Khubutse, Mt. Pumori, Changtse and Khumbu ice fall, instead of Mt. Everest. The ascent to Kalapatthar or 'Black Rock' will offer the best views of Everest. At the top, you will have a 360-degree view of some of the highest peaks in the world including Mt. Pumori (7,169m), Mt. 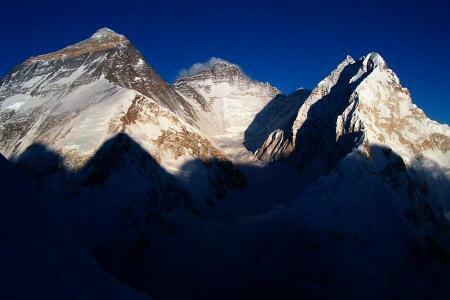 Everest (8,848m) and Lhotse (8,516m), the Tibetan peak Changtse, Nuptse (7,861m) and countless other smaller peaks. You will then descend and return to Lobuche same way and then continue to Dzong La and to Gokyo Valley for crossing another two high passes, Cho La and Renjo La. Today, we start with a gentle climb at first hours towards the Cho La Pass. The trail crosses the glacier which is marked by cairns. Once we reach Cho La Pass, the trail goes downward to Thangnak. We then continue our trek passing by the lakes at Gokyo which pours down to the western division of the Ngozumpa Glacier. We go diagonally through the three outstanding lakes and traverse the third lake, Dudh Pokhari, and on the East bank we can mark the community of Gokyo. Walking along the lake, you can view the splendid summits of Cho Oyu and Gyachung Kang. Today we begin trekking early taking about 3 hours to reach Gokyo Ri for a stunning view of sunrise over Mt. Everest, Nuptse, Lhotse, Amadablam and other several huge peaks. And the sights perceptible from here are superior to those from Kala Patthar. We go away from the main path and cross Renjo La via Dudh Pokhari. After about 3 hours we get to Renjo La , where an unbelievable panorama lies ahead. The Everest, Lhotse, Cholatse and Taboche can be seen glowing in the sun. Patches of snow along the path while moving down can make our way down a bit dangerous. Along the way, we can see Relama Tsho and Renjo Lakes. We hike more or less for one hour to reach Lungden (4,350m.). Walking down to Thame today, we take the usual route used for centuries by Tibetan traders. Moving down, we cross the Bhote Kosi and the trail again descends to Taranga. The path then goes all the way through the valley of Langmuche Khola. We trek downward after crossing a bridge until we reach Samde, where you will have wonderful views of natural scenery. Then the path abruptly descends to Thame village. Today we will walk beside a river and after crossing a bridge we make our way up through birch and rhododendron forests. Following the route to Lukla, we will scale different Sherpa villages and cross a suspension bridge above Thado Koshi. For about 45 minutes, we continue with our trek until we reach Lukla, where we reconfirm our flight reservation. After flying for 30 minutes, we arrive in Kathmandu in the morning and transfer to the hotel. The rest of the day you can lighten up. Airports pick up and drop off (International and domestic both). Food during the trek (full board with breakfast, lunch and dinner and one cup of tea/coffee/hot chocolate per day). Domestic flight Kathmandu - Lukla - Kathmandu for guest and guide inclusive of all taxes and transfers. First aid medical kit, Oxymeter to check the heart rate an pulse rate at higher elevation. Unique Adventure International duffel bag for trekking and a trekking map. Nepal visa (USD 40 for 30 days). Travel insurance (for helicopter evacuation if needed while trekking). 05.) A comfortable day pack, preferably with a waistband.